Are you struggling with chronic pain as a result of rheumatoid arthritis? Have you tried all sorts of solutions but haven’t had any luck? Maybe you’ve heard about cannabidiol, or CBD, for treating the pain of rheumatoid arthritis. Yet you’ve steered clear of it because you are wary of using cannabis. But CBD could be just what you need to ease your pain. So we’re here to clear up any confusion around cannabidiol and its connection to marijuana. Though both come from cannabis plants, there are some distinct differences. Cannabidiol oil comes from hemp. The hemp plant is part of the cannabis family. Since cannabis is used as a recreational drug, there’s always some controversy around using products made from cannabis plants. That’s because most people are thinking of delta-9 tetrahydrocannabinol, also known as THC. It is important to note, however, that since cannabidiol is extracted from hemp plants (or sometimes medical marijuana plants) as opposed to recreational marijuana plants, it does not contain THC. Both come from the cannabis plant. But marijuana plants are selectively bred to contain high levels of THC. Hemp plants are not. And even cannabidiol from medical marijuana does not contain THC. There are many ways to get this oil through different products, though the amounts of CBD in them will vary. Rheumatoid arthritis is a progressive and chronic disease that causes inflammation in joints. It’s a condition that causes the body to see normal tissues as invading pathogens and attack them. It most commonly affects people between the ages of 25 and 45, though it can affect children as well. The inflammation attacks the lining of the joints and then spreads to cartilage and bone while causing destruction. It eventually causes immobility and painful deformity in the feet, ankles, knees, hands, wrists and fingers. Additionally, the swelling, pain and heat that come from inflammation not only affect the joints, but the organs as well. There is no specific cause, though there are many environmental and genetic factors. Not everyone will feel the same symptoms and they can vary from one person to another. Most of the time, diagnosing this disease is not difficult as it progresses quickly. But blood tests can also help to identify rheumatoid arthritis. Some people have found success using CBD oil to relieve pain and reduce inflammation. That’s because the oil affects your immune system, which naturally makes it helpful for autoimmune conditions like rheumatoid arthritis. In fact, a study published in the journal Rheumatology found that CB2 receptors exist in unusually high levels in the joint tissue of arthritis patients. The use of cannabis fights inflammation in the joints by activating the pathways of those numerous CB2 receptors. CBD oil has shown lots of improvement in the treatment of arthritis. Cannabidiol helps reduce pain and inflammation caused by arthritis of all types like Rheumatoid arthritis, gout, osteoarthritis and other types of inflammatory joint conditions. More and more doctors are treating their rheumatoid arthritis patients by using cannabidiol oil to provide relief from the inflammation and pain. Patients experience less pain and inflammation and overall improvement. Also, cannabidiol seems to slow the progress of this painful disease. So it can be especially beneficial to those who have recently received a diagnosis and don’t want to resort to heavy duty painkillers and other drugs. Another taboo around using cannabis related oils is how to administer it. Forget the Cheech and Chong movies. It’s not like that. But for some people, there is a stigma around using it. Fortunately, there are several different options for getting cannabidiol into your system to ease the pain. Though you may initially be uncomfortable with this method, both smoking and vaping are the most effective ways to consume CBD, particularly if you live in a state with more rigid marijuana laws. If you’d rather avoid the burning that comes with smoking, go with a vaporizer. Just like when you rub some IcyHot onto your skin to ease that sore back, a topical CBD salve rubbed into joints and muscles can provide pain relief. Cannabidiol salves are easy to find in dispensaries, but much harder to get ahold of in states where marijuana is not legal. Tinctures are liquid extracts made from herbs taken orally and are usually extracted in alcohol. But if alcohol is an issue, they can also be extracted in vegetable glycerine or apple cider vinegar too. They’re easy and convenient to use. And they’re effective. Simply put a few drops under the tongue or perhaps mix it into some juice or water. Whether it’s baked goods, hard candy lozenges or even gummy bears, if you’d rather eat your CBD, you have all of these options. Ingesting CBD requires a little bit of experimentation because it takes longer to metabolize than the other methods. Whichever method you choose, you’ll need to have some willingness to experiment with and sample different strains. They all have their strengths and weaknesses so you’ll need to see what works. You might be surprised at the sensation supplied by CBD-heavy strains. Not only do they help to ease painful joints, but they also help with sore muscles. Plus, they can have calming, relaxing, with powerful soothing effects. Even when they don’t have THC. You don’t have to rely on drugs for the rest of your life. Using CBD along with other natural ways to manage your disease could be just what the doctor ordered. 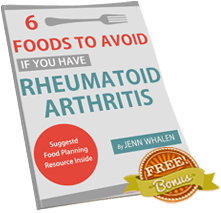 And if you want even more information on how to live with rheumatoid arthritis, educate yourself further with our downloadable free e-book: 6 Foods To Avoid If You Have Rheumatoid Arthritis.